Look at this section of my friend’s dad’s amazing front garden. It’s so resplendent – full of colour & texture. What I love most about it is the fact that it looks so organic – as if it grew like that without any human intervention. Little things like the use of ground cover plants to soften the hard edges of the pebbled concrete – to the visually anchoring stone fountain (unshown), wrapped thickly and tightly around with a ring of well trimmed bamboo / grass type plant – really makes this space special. It’s also very clever as well – rather than just having a garden bed full of undergrowth only, it is vertically layered. Just as undergrowth can be used to soften hard edges at ground level, layering at head height softens the rendered walls in the background, adding to the feel of intimacy in this space. Vertical layering at head height with lots of green foliage frames & tightens this space – drawing the eye down and around to the field of colour below. One other thing that makes this space so successful – and I don’t see it often enough in many gardens – is the fact that the plants are left to grow into each other’s space. Lots of gardeners are too concerned about their gardens getting ‘untidy’ and ‘unruly’ – constantly pruning and always keeping plants at a safe distance from each other – mulching in between with pebbles to highlight the ‘tidiness’. Well, I really hope that this garden has show that sometimes when you let nature do it’s thing it is actually quite wonderful. 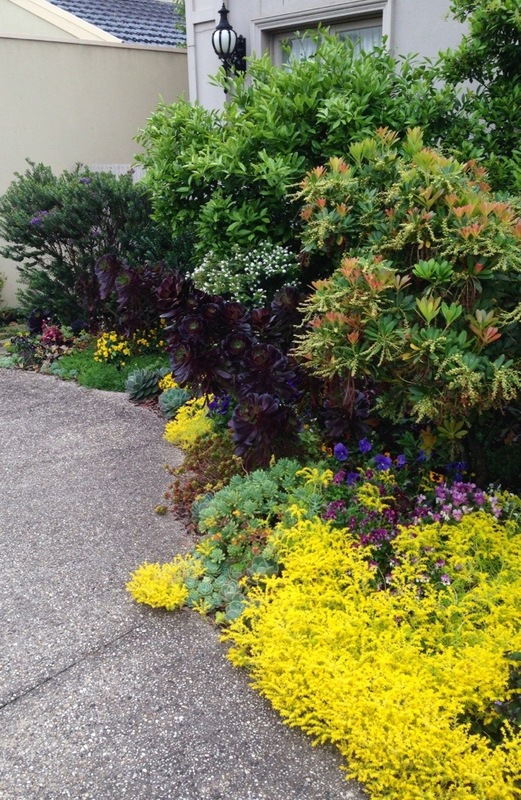 Although this photo shows just a section of their front garden – you can imagine what the rest looks like.